Watching Paulson and Bernanke flail around has been a bit time consuming this month. While it's still September, let's get to the rodeo. I've circled each August on the chart. The point is to show that we are just entering what -- in the past two years, anyway -- has been the seasonally weak period for prices. If the pattern applies again the price declines may pick up the pace a bit in the months ahead. Between the unprecedented level of foreclosure activity and the weak local job market, it looks like more downward pressure is immediately ahead for San Diego housing. All in all, there's going to be some serious distorting of the marketplace in the months and years ahead. At least it never gets boring. Submitted by SD Realtor on September 27, 2008 - 10:05am. Rich as usual I agree with all of your points, the most important being the level of distortion of the markets. Funny that this recent "bailout" is being characterized as a singular point. It is not even close. The amount of money being pumped into the supply, the discount window, etc has been in the hundreds of billions if summed up over the past year. So what is another 700? As we all know this is just the beginning or shall I say the continuing of the feds activity. I am glad you pointed out the possibility of principal reductions as well because there seems to be this prevailing opinion that none of these measures will distort the free market dynamics and I don't understand those thoughts at all. Regardless, I am seeing another disturbing phenomenah and that is the dramatic slowdown in REO and short sale processing. It has become quite clear to me that the servicing orgs are now literally crawling with regards to the processing of these events. My guess is because they smell blood in the form of taxpayer money and I truly believe that they are going to sit on most short sales and foreclosures until the feds come through. It is unfortunate because I believe we were reaching a point of tolerable performance on the part of these servicing orgs but now it is clear to me they have completed taken a new path. Submitted by DWCAP on September 27, 2008 - 10:51am. What did the gov do during the last down cycle? I mean, we didnt have this level of pain in the marketplace, but did we have bailouts then on the same pain adjusted scale? Maybe 70 billion instead of 700B? It seems that alot of people have based their opnions of what will happen on two things, 1)past performance; and 2) Basic economic principals. Well the Gov is doing everything they can to kill number 2 and instert basic political principles instead but what about 1? Did they do this before? If not, how acurate of a guide is past performance if the realities of today are so much different? Submitted by peterb on September 27, 2008 - 10:57am. These failouts seem to be more in line with stalling and delaying the process than reversing the trend. IF they are successful at this, we're probably looking at Japan in the 1990's. A lost decade of economic performance. If they're not successful, the cliff diving championships will be held throughout 2009. I have to admit that the look on Hank and Ben's faces is scaring me. I think they're praying for an orderly unwinding verses a collapse. Submitted by SD Realtor on September 27, 2008 - 3:17pm. Peter this is exactly what I see, nothing but trying to delay the process and add at least a component of time to unwind rather then fall apart. Agreed about the 1990s Japan model entirely. Submitted by trc on September 27, 2008 - 6:33pm. I've never read Rich discuss the multiple offer situations and intense competition out there in the entry level SFR market in SD County. I seems like any well priced bank owned home in a decent neighborhood gets multiple offers the day it hits the market & often goes for well above list. Albeit the final sales prices is WAY off the 2005 highs. I've been told the early 90's crash was not like this, that it was easy to get lowball offers accepted. I didn't expect to have similar competiton for houses in the middle of a crash as 2004! I know certain buyers at the lower end of the SFR market that have had to make 50 offers over a 6 mos period to land a property. And those were offers at list price. I expected it to be much easier to buy a property during a crash. I guess it's never easy in San Diego. I've also noticed that people not *IN* the market everyday making offers, don't get this. Folks that just surf the bubble blogs and read the media all day are under the impession you can walk around like a kid in a candy store and make lowball offers on anything you want. Not the case as far as I've seen, unless the house is an ungodly dump where no one can get financing on it. Submitted by peterb on September 28, 2008 - 10:40am. Give it a little more time. I think we'll be lucky if we get the Japanese 1990's. At least they had jobs to keep them going. Try 15% unemployment on the housing market. See what happens to all the people who were out looking for a home then. Nothing quite like being unemployed or worrying about being unemployed to quell one's desire for a 30 year debt. I hope like hell I'm wrong, but this looks really bad to me. we dont make much of what the world wants anymore. If we cant feed on our own system, then I think we're in for pretty tough times. Submitted by sdduuuude on September 28, 2008 - 5:17pm. trc - those people are discussed all the time. You'll know whenever you see the words "knife" and "catcher" right next to each other in that order. Submitted by CA renter on September 29, 2008 - 12:57am. What you are witnessing (and what SD Realtor, sdrealtor and others have discussed in various threads) shows we are nowhere near a bottom in this market. We are still nearer the top of the bubble than the bottom, especially where psychology is concerned. The price movements from 1997-2007 were unprecedented in size and scope. Everyone watched in amazement as prices shot up like a rocket. They still think RE is the "path to wealth" and they want to get in "before this opportunity slips away" and they are "priced out forever!". Knife-catchers, all, IMHO. We have YEARS of deflation ahead of us, and even if they managed to halt all foreclosures, we would still see price declines like you've never seen. This was a CREDIT bubble, not a housing bubble, and it had its roots in the early 80s. What we saw from 2001-2007 was a parabolic move, seen often at the tail end of extremely powerful bubbles. Prices may well decline steadily into 2012, and stay stagnant/fall slightly for years after that. By the time it is really "time to buy" the vast majority of people will have neither the means nor the guts to enter the market. That time is a long way off. Pay close attention to the credit markets and the dollar. That is the real story. Submitted by trc on September 29, 2008 - 10:38am. Still doesn't explain why we have so much more demand in the middle of this crash then we did in the eary 1990's crash. As Rich has said, I also think the price declines from here on will be uneven. I think the coastal areas and better neighborhoods of San Diego have a lot more to come down. But I think the South Bay and East County entry level SFR market may be a lot closer to the bottom. The price declines have slowed in those areas. When you hit the $275k-$325k range for SFR's in those areas, a lot of people making the median income can buy that full doc and have payments not that much higher than rent. I can see that house in Encinitas or Rancho Bernardo going from $900k to $700k, but I'm not so sure that $275k house in El Cajon will drop to $200k. Because there is already so much demand at $275k. 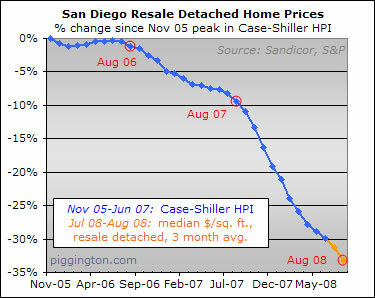 Submitted by SD Realtor on September 30, 2008 - 6:33pm. trc I cannot explain the phenomenah but I will give it my best shot...What you said is no mirage and I can say with all honesty that this has been my best month in the last 5 years. I think the demand you speak of is still varying to some degrees by area and will continue to do so. Some areas are displaying pricing that is getting scary close to positive cash flows with 20% down. Other areas are coming in with sales pricing that is affordable (comparativey) for buyers who have sat on the sidelines. Once again, this is not a vote to buy now, nor is it an endorsement of the bottom. Far from it in fact, especially on the bottom part of it. No way I will be able to wait for the bottom. Looked at some homes this weekend and even checked out the lot on Lone Jack that is sliding into the canyon for myself. So I am pretty sure I will be owning another place within a year but financially I would rather wait if it was only a dollars and cents decision. So yeah I agree that this secular decline will not (and has already differed) greatly from the previous one however the activity you have seen does not to me indicate we are near bottom. As to how far the desireable places will run down. I believe it will all be determined by employment.